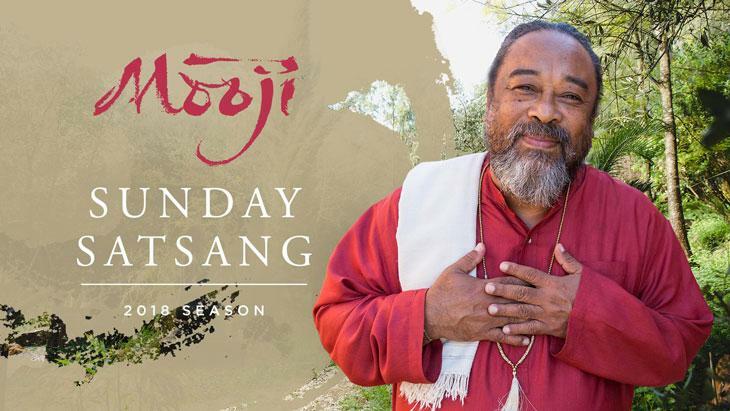 Mooji offers Satsang at Monte Sahaja on Sunday afternoons whenever possible. Sometimes, these Satsangs are followed by Tea Satsang, where Mooji reads letters and shares his responses. These Sunday afternoons with Moojibaba are a beautiful way for people all over the world to come together for this sharing of Satsang with the Master, with thousands joining from home via live Internet broadcast. This year there is a change to the way Sunday Satsang is being offered at Monte Sahaja. Previously it was possible to attend without prior registration. However, as Sunday Satsangs are part of the program of Monte Sahaja, they are for sincere seekers with a burning desire for Truth. These are not ‘drop-in’ Satsangs. If you feel a genuine connection with Moojibaba and his pointings and wish to come to Sunday Satsang you are welcome to apply. Applications are now closed. Satsang generally goes for 1.5 – 2 hours, but can occasionally also run longer. The schedule is also subject to change, so please check back here regularly. Attendance is by donation. Information about other events with Moojibaba can be found on the schedule. Approach Satsang with the understanding that it is not a casual event—it is for those earnestly seeking Self-realisation in this life. Remain inside the Satsang Hall until Mooji has left the room. This is out of respect for what he is offering to all of us. Please understand and respect that it is only during Satsang that Mooji invites questions—he will not receive questions afterwards. Be on time. You are welcome to arrive at Monte Sahaja from 2pm onwards. Please do not arrive earlier, but also keep in mind that it is a 5-10 minute walk from the parking area to the Satsang space so allow yourself good time to arrive. If you arrive after Satsang has begun, you may not be able to enter the space. Wear modest clothing; avoiding tight, revealing, or transparent clothing. We do not have a separate designated space for children. Please do not bring your child to Satsang unless they are truly interested and are able to participate quietly for the whole program. Do not bring your dogs or other pets to the Sunday Satsangs. It is essential that everyone who is considering attending Sunday Satsang at Monte Sahaja first watches this important video: An Invitation to Freedom. If you have been invited to visit Monte Sahaja for Sunday Satsang and wish to stay in the surrounding area, you must arrange your accommodation before you come. Monte Sahaja is located in a very remote and rural part of Portugal and accommodation is limited. Please be aware that Free camping or ‘wild camping’ is strictly prohibited in this area. This includes camper vans parked in public spaces and in the villages. If you plan to stay in the area after Sunday Satsang and you would like to visit Monte Sahaja, it is necessary to apply separately. Please click here for more information. When offered, Sunday Satsangs are broadcast live on Mooji TV and you can join from anywhere in the world on the Live Satsang page. It is also possible to view previous Sunday Satsangs on Mooji TV, many of which are also translated into a range of different languages. If you have limited internet bandwidth or you are on the road, you can also listen to Live Satsang on the Mooji TV audio-only channel. Live translation will be available in different languages both onsite and online. The languages offered may change, so please check here closer to the date. This translation service is lovingly offered by a team of devoted, non-professional interpreters. It is very helpful for some participants to listen to Satsang in their native language, however please be aware that there is always the possibility that some of Mooji’s words or meaning is missing or not translated perfectly. Naturally, Mooji’s own, unfiltered words are the highest and most powerful transmission, but many have benefitted deeply from listening to the live translation. Please note that live translation is offered only for Satsang. All other communication and written information will be available only in English. to install the VLC player app for Android or iOS. For more details about the online broadcast check here.